Judging by the previous times something like this came up, there's probably a configuration error somewhere. This ad actually went somewhere, though. Here's the link it went to, minus the doubleclick redirect and the query string, because I have no idea what might be encoded there. Thanks for bringing this to our attention! We have identified which advertiser this ad relates to and have notified them of the issue. The most common reason the cloud ad is served is that an ad tag is being implemented improperly. We are working to correct this, so you should not be seeing any clouds in the future (unless of course it's a cloudy day). Not the answer you're looking for? Browse other questions tagged bug advertising . 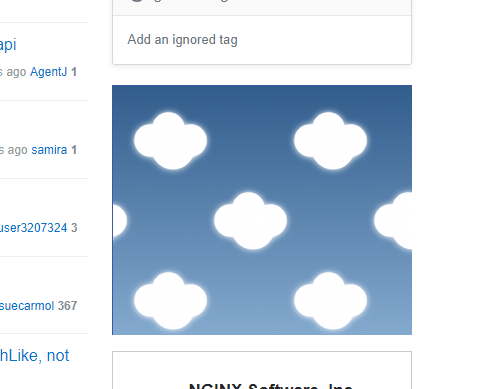 Why an image of clouds made of dots as an ad?